We've been promised smart clothing for years, but it's often been an anticlimax, nothing more than a bunch of LEDs showing a crude picture stitched into a dress. However, cutting edge technology is ringing the changes - from purely biomechanical brilliance through to the wildest digital flights of fancy - so the possibility of having useful gadgets melded into our very apparel is close to reality. We're seeing genuinely useful modern fabrics that are stronger, lighter, longer-lasting and greener than ever before, as well as new types of conductive textiles that will without doubt change what we wear and how we wear it forever. 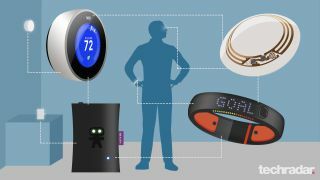 The concept of embedding woven sensors has been well and truly taken on board, with companies such as Athos and MyZone producing integrated wearable performance monitors that go way beyond existing HR bands and straps. High fashion has a long pioneering history of using high-impact visuals in catwalk wearables, and there's even trickle down into actual street clothing - one example among many being Emel + Aris, which is creating stylish trench coats containing heating polymers to ward off winter chills. From John Cleese's Q showing us an invisible 'adaptive camouflage' Aston Martin in Die Another Day to Harry Potter legging it around and flagrantly breaking school rules there for his protection, we've hankered for invisibility cloaks in modern life. Great news: recent advances using metamaterials have made this even more likely - albeit in certain situations. Scientists from Karlsruhe Institute of Technology in Germany have invented a basic and portable box which makes items inside disappear. Sprayed with a metamaterial-loaded paint, the box bends light around the core area, where the 'invisible' item is, and uses light-scattering paint over the rest of the surface to conceal the illusion. The result is making small items such as mobile phones seem to disappear entirely. This might sound a bit too conceptual for some, but the US military has taken the whole idea very seriously indeed, issuing detailed requirements for 'invisible uniforms', and requesting suppliers be able to start delivery six months from now. Several US companies, including Hyperstealth Inc, reckon they're on target too, although whether they've developed a powered solution a la James Bond, or a more traditional camouflage using radical printing technology is anybody's guess. As usual, the military drives a lot of the research into cutting edge wearable tech, and one particularly important area has roots in the Medieval period: armor. Although hard armor is still used in many applications, its cumbersome weight and lack of flexibility puts wearers at a bit of a disadvantage, and that's even before they get the call of nature. Kevlar - invented in the 60s - is OK for the purpose, but it's still pretty heavy, and needs reinforcing with ceramic plates for heavy duty impacts. A Polish company called Moratex has created a non-neutonian shear-thickening fluid, or STF, that changes viscosity dramatically on impact, absorbing way more energy than standard kevlar, and it's more comfortable to wear. It's a fair bet the military is keeping wraps on this for the moment, but working prototypes exist, as the video demonstrates. Another more Iron-Man strategy to replace solid armor involves the use of a special type of magnetorheological fluid, a version of which is already used in Lamborghini suspension dampers. Essentially this fluid becomes much more viscous when activated by a magnetic field, and can be varied by the strength of the field. Great for high-end car suspension, but also brilliant for super-thin energy-absorbing armor which can theoretically become infinitely strong - depending on the power of your electromagnets. Although the technology is still at the research stage, and won't be cheap if the military approve it for civilian use, it is the closest option we have to a real-life version of Tony Stark's armoured suit. At the very razor's edge of science, even invisibility cloaks have been shoved aside by an considerably more insane material recently developed by Harvard researchers. It's a new type of foldable material that's versatile, tunable, and self-actuated to change size, volume, and shape; it can fold flat to withstand the weight of an elephant without breaking, then be reconfigured for the next task - maybe a jacket, or an emergency shelter. "We've designed a 3D, thin-walled structure that can be used to make foldable and reprogrammable objects of arbitrary architecture, whose shape, volume, and stiffness can be dramatically altered and continuously tuned and controlled," said Johannes T.B. Overvelde, a Harvard graduate student involved in the research. Like incredibly complex origami, the structure is made from extruded cubes with 24 faces and 36 edges which can be deformed by programmable pneumatic actuators into any shape required. Just to put that into context, this means a single lightweight sheet of this material could be made into pretty much anything, from a house to a chair, or clothing - like a liquid metal Terminator, without the endless murderous pursuit. The immediate applications are in areas such as disaster relief, but the technology could change the way we live completely - if your jacket was also a chair then dinner parties could be much more exciting affairs. Sadly, the new material is still just at concept stage, but the team reckon they've got the practicalities firmly licked, so expect to see an entirely new class of 3D, changeable structures in the very near future. It's not all about super-high technology though - smart materials are being used to help reduce the damage we're doing to Mother Earth. Many companies have begun to seek more sustainable, ecologically sound alternatives to existing, often petroleum-based fabrics and production processes. A great example is Patagonia's Yulex, a natural alternative to non-renewable, petroleum-based neoprene and developed in partnership with Yulex and the Forest Stewardship Council (FSC). Natural rubber itself isn't robust enough to make wetsuits out of, but by blending the FSC certified rubber with 15% neoprene-free synthetic rubber, Patagonia reckons it's created something that's UV stable, durable and produces up to 80% less CO2 emissions per suit. No list of cutting edge fabrics would be complete without a mention of Google ATAP's Project Jacquard. Although it's yet to formally announce any consumer products, the high concept draws parallels between the physics of touchscreens and the weave of fabric, proposing that touch control interfaces can be seamlessly built into clothing. As you can see in the video, the tech giant looks to have progressed to the point where proof-of-concept fabrics are available, with the stated aim that the production process is replicable on standard weaving looms across the globe - so not super-expensive. Although the project was announced several months ago, it's clearly still very much a going concern, as recent job ads for a hardware and product manager prove. Meanwhile, across town (in Ohio), a group of college researchers has succeeded in embroidering circuits into fabric with 0.1 mm precision - which happens to be the perfect size to integrate electronic components such as sensors and chips into clothing. The team have dubbed the materials 'e-textiles', and have begun to stitch smartphone aerials into jackets, for example, and look at other developments such as flexible caps which detect brain activity. As with Project Jacquard, the Ohio State University researchers are using standard sewing machines, so the ability to go mainstream quickly and cheaply is huge.